Sikkim Public Service Commission Officials released SPSC Staff Nurse Recruitment 2019 Notification. 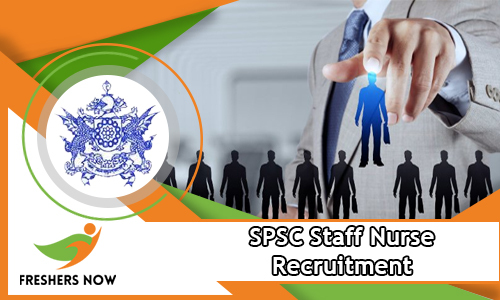 Interested Candidates from the Sikkim State, who are looking for the Government Jobs, can actually, use this chance, by checking out the total information given in the Official SPSC Staff Nurse Recruitment 2019 Notification. Well, the Sikkim Public Service Commission Officials clearly mentioned that by 23rd February 2019, interested Candidates, have to submit their filled Sikkim PSC Staff Nurse Online Application Form 2019. Remember at the time of submitting the application form, contenders, need to have all the qualifications that are given in the SPSC Staff Nurse Notification 2019. Contenders after checking the total details, candidates, can go to the Official site of the Sikkim Public Service Commission at spscskm.gov.in, and then they can register and apply online. Remember, to check the above table. And that table contains all the information that an individual need to have at the time of applying for the SPSC Staff Nurse Recruitment 2019. Aspirants should have completed their Class XII from any recognized Board along with Diploma in General Nursing and Midwifery (GNM) from any recognized Nursing Institute or any Higher Nursing Education and registered within the Sikkim Nursing Council. Candidates age should lie between 18 Years to 40 Years. If, applicants want to know more details about Age Relaxation check the official SPSC Recruitment 2019 Notification once. The officers of the Sikkim Public Service Commission (SPSC) will conduct the two levels of the selection procedure. Selected applicants are going to get Rs. 9300/- to Rs. 34800/- along with Grade Pay of RS. 4200/-. Contenders should pay Rs. 150/- through Credit/ Debit Card, Net Banking by Visa/ Mastercard. On that page search for SPSC Staff Nurse Recruitment 2019 Notification. Check the Sikkim PSC Recruitment 2018 Notification carefully. Therefore, stay tuned to our site Freshers Now to get the current updates about SPSC Staff Nurse Recruitment 2019 Notification.